Boat work on Serendipity has been steadily progressing, but we are still looking at a s&*t ton to do when we get back from our backpacking adventure. I’ve already talked about how the port side deadlights can’t be done until we pick up more Dow 795, and although Matt has disassembled our dining table in the salon to reconfigure it in a way that will give us more space, many parts for that also have to be purchased in the states. So one more project added to the back burner. Our days have still been quite busy though, Matt’s slowly working his way through varnishing, and has completed both sides of the salon and the nav station. He doesn’t want to begin on the galley with only a couple of days until we depart, since each area is averaging about five days to complete. I’ll have a bunch of projects piling up as well for when we get back, jerrycan covers, shade covers for the cockpit, redoing the winch covers. But until we leave my focus is on Spanish lessons, and I will continue to savor the days while rocking back and forth in the hammock with my laptop resting on my stomach for as long as I can. Today I was finally able to convince Matt that not every day needs to be filled from morning to night with boat work, and that we should enjoy being in Guatemala and the Rio Dulce. Every day we’d see backpackers come through the marina and take the kayaks out on the river, and each time we’d say ‘We really need to do that sometime’. Since it’s so easy for ‘sometime’ to become later and later, I made sure today would be that day in case we get back in a few months and we’re so overloaded with projects that we didn’t get to enjoy this one pleasure. Waiting for the sun to sink low enough that we’d enjoy the trip in the kayak instead of swimming along side it in the water since that might be more refreshing, we walked the path back to the line up of them and chose the sturdiest looking one. None of the kayaks available were for one person only, and we coordinated our paddles to back out of the spot and work our way under the docks and out to the river. 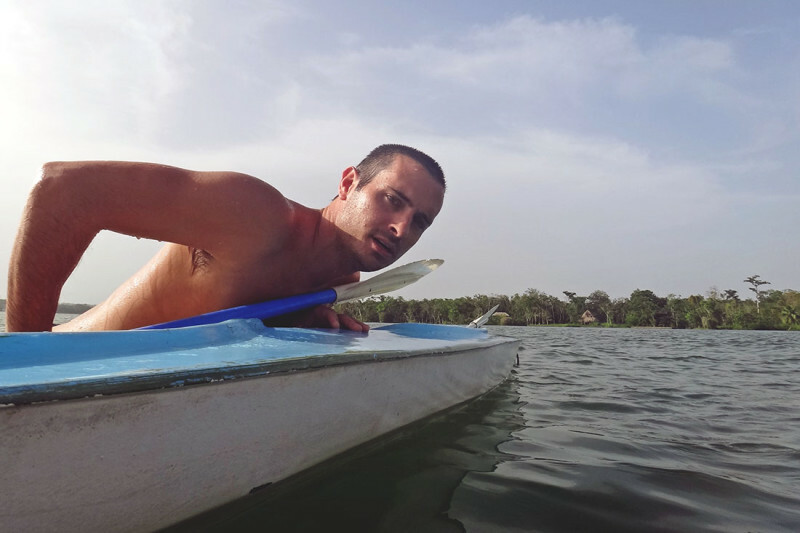 I had momentary flashbacks at how terrible the two of us were at trying to synch up paddling while out in canoes, or even when we had our own kayaks, how I could never keep up with him. But today, it was fluid. Easy. Turning right out of the bay, we pointed the bow towards the castillo and sliced through the water on our way there. 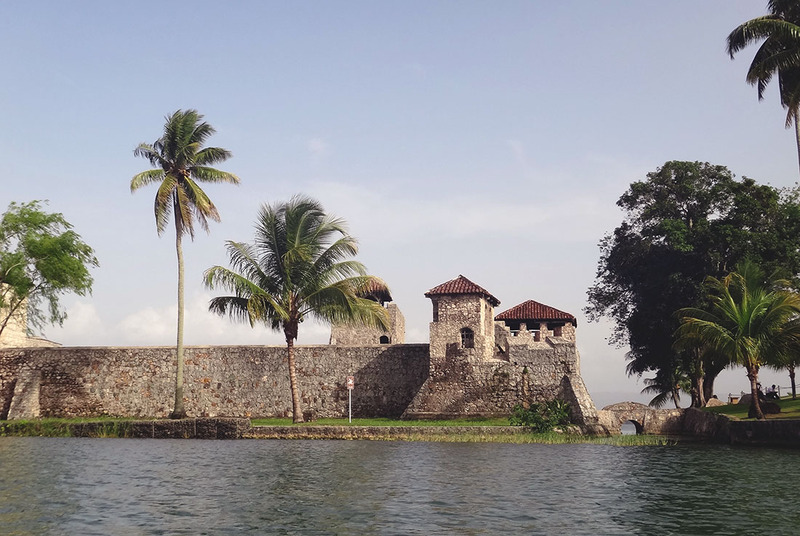 The Castillo de San Felipe was built in 1644 and used at the mouth of Lake Izabal to protect from frequent pirate attacks from the English. 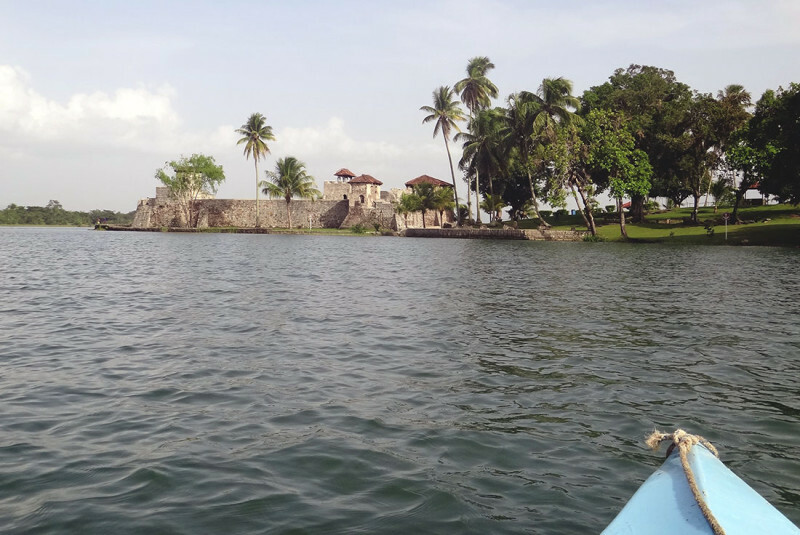 It’s said that after nightfall, the passage along the river into the lake was blocked by a large chain that crossed from the fort to the far bank. It was added to the UNESCO World Heritage Tentative list back in 2002, so should it ever get added, it will be one more we can check off our list on these travels. 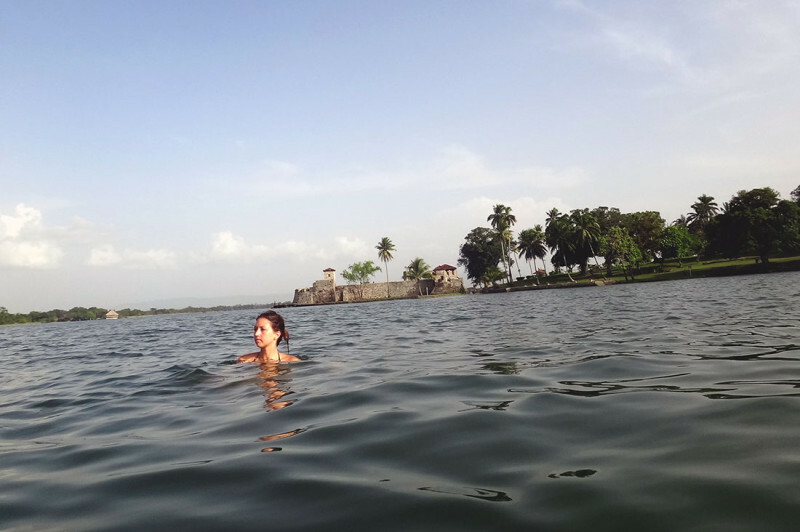 It didn’t take us long to get to the castillo, and even though you can take tours of it, we neither had money nor clothes with us. Instead, we let the current of the river push us almost into the reeds, and then slowly worked from one side out through the pass and into the lake to see the other. Not quite ready to head back just yet though, we continued up the lake, keeping an eye out for a restaurant called Kangaroos that’s supposed to have the best burger in town. (Hopefully, not made from kangaroo). We paddled up the shore, spying on any property close to the water, but nothing caught our eye that might have been a restaurant. Or if it was, it was literally someone’s home with a couple of picnic tables outback. Which, since they were seating people, we almost beached ourselves to check out. In the end we decided that the dinghy might be better for this kind of excursion and turned ourselves around for home, but not before taking a quick dip in the river in front of the castillo. On a side note, I was walking to the backpackers bathroom a few days ago, and there was a commotion in the water so I looked down to see what it was. 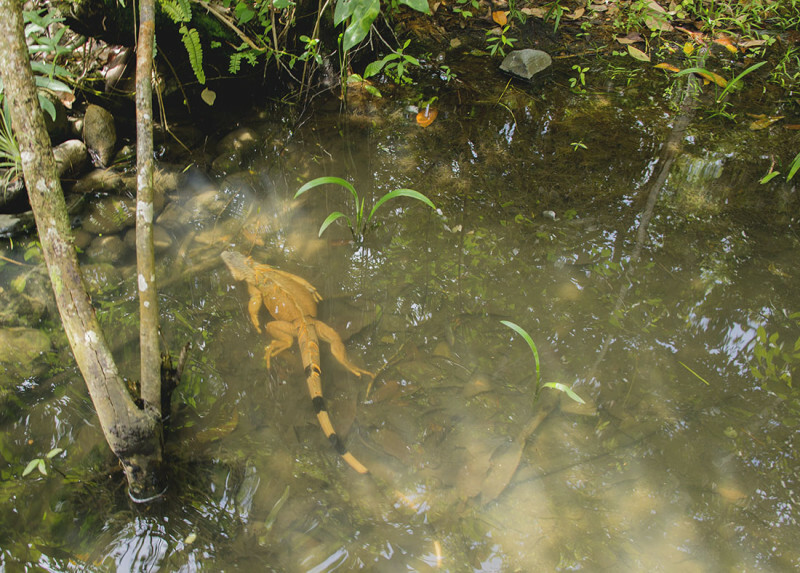 I was not expecting what I saw, which was a large orange iguana, shooting from one side of water to the other. It must have been about five feet long including it’s tail, and had long spikes running down it’s back. I’m sure it was more scared to see me than I was to see it, but I think I might limit my swims out by the dock. 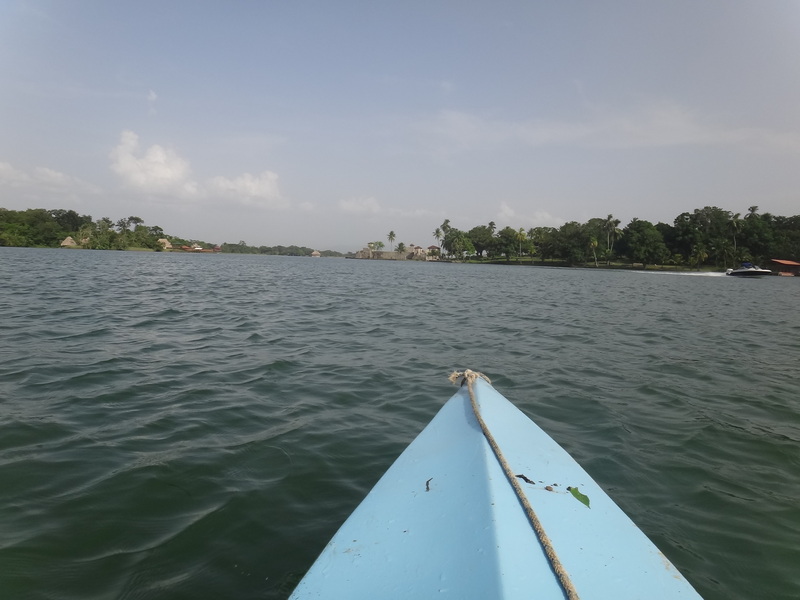 This entry was posted in Guatemala and tagged Castillo de San Felipe, kayaking. Bookmark the permalink.